Lynn Lavner embraced the nickname of "America's most politically incorrect performer" and made it part of her comic routine. Thanks to my father’s late-life nostalgia, last summer my family reconnected with a woman we’d known back in Brooklyn decades ago who’d gone on to live a remarkable life. Her name is Lynn Lavner, and it turns out, she’d been living under 10 miles away from my parents’ place in south Florida for years. It also turns out that in the decades since we’d seen her, she’d become a pioneering crusader in the movement for equal rights for the LGBTQ community. 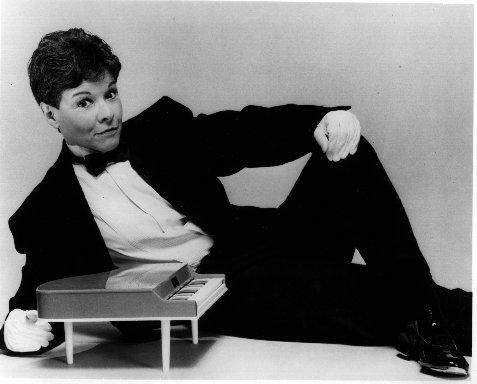 Listen to some Lynn Lavner performances and hear her tell stories about being a gay rights activist and performer. Or you can listen to a longer version from the podcast, Gracefully, at the link below. Though my parents had been full-time residents of Florida since 1988, in the last years of my dad’s life his mind got stuck on his happiest time, during the late 1970s in Brooklyn, New York. That’s when a small crew of people were running around various venues in the New York area, performing a musical he’d co-written with his dear friend, Chuck Reichenthal called "Hit Tunes from Flop Shows." The first piano player for the show had been Lavner, who at the time also was a teacher at Ditmas Junior High School in Brooklyn, a school both my brother and I attended. One day last August, my father demanded with some urgency to know where Lynn Lavner could be found. I remembered her name and wondered, too, what had become of her. Wanting to be a good daughter, I took out my laptop and started searching. It took less than a New York minute to determine that she lived nearby. My father asked for her phone number and, forgetting the social nicety of not calling until a certain hour, punched in the number. Her partner of four decades, Ardis Sperber, answered and he identified himself as if he’d just talked to the two of them yesterday. And, as is the case with most old friends, it was almost as if they had—like they’d just been sitting around waiting for him to call. 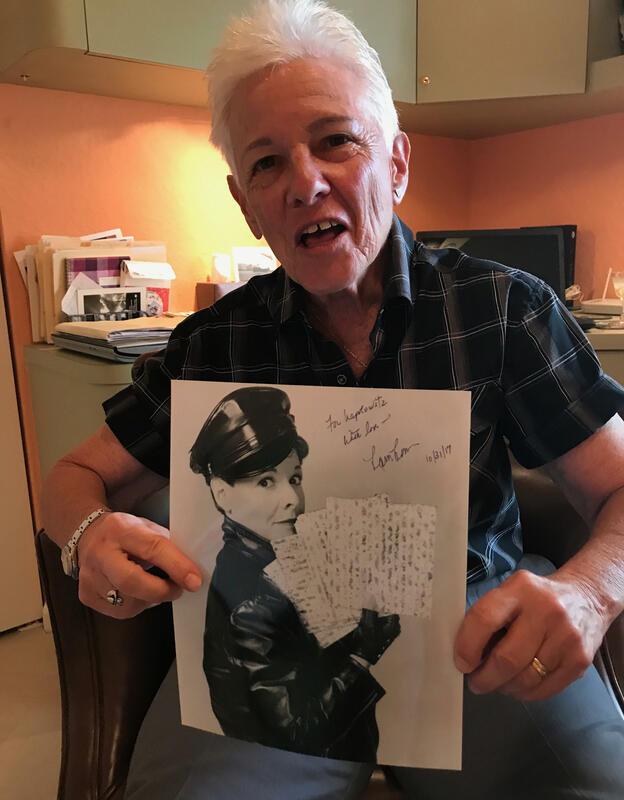 Lynn Lavner poses with a poster of one of her performances. Since we’d lost touch, Lavner had left teaching, and become a major figure on the LGBT performance circuit. From the gay and lesbian clubs in New York, she’d gone on tour around the world as “America’s most politically incorrect performer,” hosted at women’s festivals and other venues that were boldly being staged to rally for what then seemed unattainable: gay civil rights. She’d become one of the public voices of the crusade for equal rights at a critical, early time in the LGBTQ movement. Ardis traveled the world with her as her manager. The friendship between these two couples rekindled quickly. Various lunch dates ensued. In October, with my parents about to mark their 61st wedding anniversary, Lynn and Ardis insisted on hosting dinner. Plans were discussed for an upcoming party, at which Lynn would play piano and my dad would sing “The Wedding Song.” It was the tune my father had sung as his parents’ 50th anniversary. That night, they practiced the number. The rest of us never got to hear Napoli/Lavner perform. My father suffered a heart attack the next day. He held on for several weeks and during this excruciating time, I comforted myself by visiting with Lynn—and asking her about her career. What you’ll hear in the audio piece above are her recollections about life on the road as a performer during a pivotal time in our history. My father gave us all an amazing gift at the end of his life: new, old friends. And I’m honored to help tell the story of a woman who herself helped give voice to a movement. Lisa Napoli is founder and producer of the podcast, Gracefully. She calls it "your field guide to growing old." You can listen to a longer version of her piece about Lynn Lavner here. 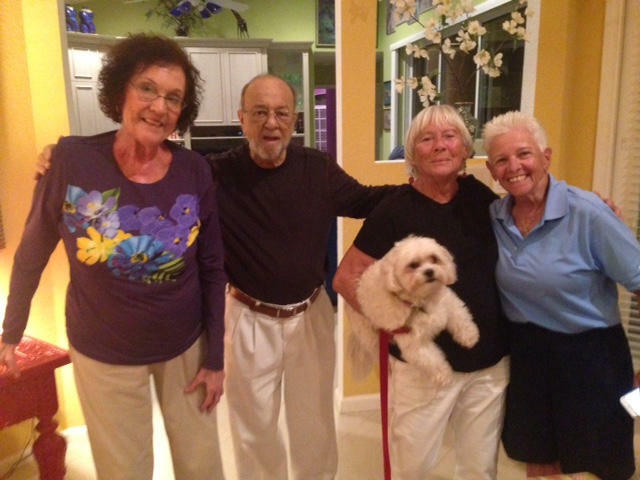 Friends reunited: from left to right, Jane and Vince Napoli, Ardis Sperber and Lynn Lavner. 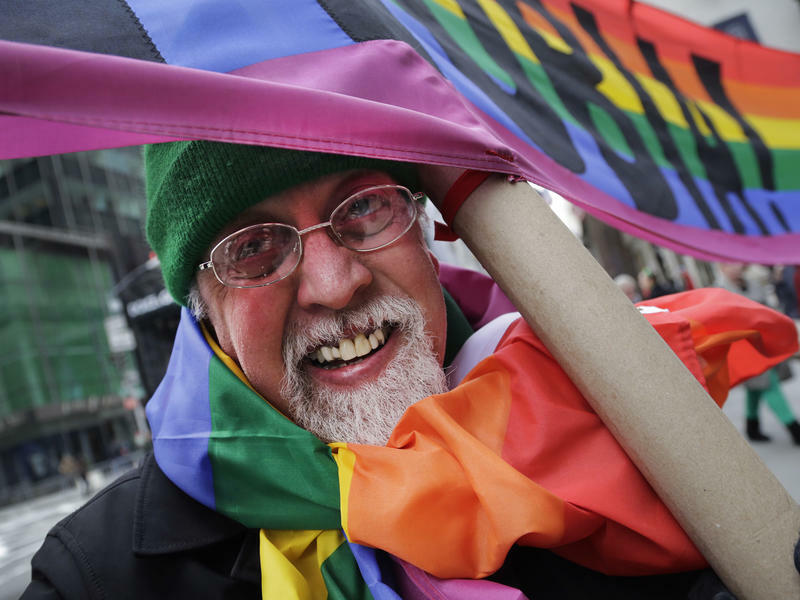 Gilbert Baker, creator of the rainbow flag, which would endure as the symbol of gay activism and solidarity for 40 years, has died. Cleve Jones, a longtime friend and noted gay rights activist, announced the death on Twitter. Baker designed his first flag during the 1970s while an active member of San Francisco's gay community. An Army veteran and drag performer, Baker found himself sought after for his deftness at costuming to make signs and banners for the burgeoning gay rights movement.